An ounce of prevention is worth a pound of cure. Learn how to prevent water damage at your home! What can I do to help prevent water damage in my basement and throughout my house? Water damage at your home can be costly, but it is preventable! DIY preventive measures are generally focused on routine checks that you should perform at your home throughout the year. Additionally, there are special preventive measures to take before any major storms or before leaving for vacation. Read on to find out how you could save yourself from experiencing major headaches related to water damage! Wacky weather and worn infrastructure contribute to countless water damage cases in homes throughout Pennsylvania each year. The good news is that there are indeed several steps you can take to help prevent water damage at your home – or at least minimize the damage caused when an unexpected event does occur. If and when you find yourself in need of professional water damage cleanup and restoration services, trust the experts at Tuckey Restoration. 1) Regularly inspect water supply lines under sinks and toilets as well as washing machines and refrigerators. In particular, look for cracks or abrasions – if you notice anything, have these lines professionally repaired or replaced. 2) Plan on replacing water supply lines for washing machines before they give out – these generally have a 4 – 5-year life expectancy (but check with your washing machine manufacturer for exact details regarding your particular model). 3) When you have the choice, use steel braided supply lines instead of vinyl. 4) Regularly inspect all water supply valves in your home for leaks around any packing nuts. Again, early detection and repair are great money savers! 5) If your home is equipped with a sump pump, check it regularly. Is it operating properly? Is there standing water around it? Does it have a battery backup or secondary pump? 6) Regularly clean out your home’s downspouts and gutters. Leaves, ice, or other debris can block these essential water runoff conduits, leaving water with nowhere to go but back toward your home. 7) Clean out underground drain lines on a regular basis – make sure water has an easy and open path out and away from your home! 8) Ensure proper grading around the exterior of your home. Landscapers and home builders should ensure that the ground is sloped in such a way that water will flow down and away from your home’s foundation – not toward it. If your grading is backwards or not distinct enough, contact a landscaper to help fix this issue. 9) Turn off exterior water hydrants when not in use, and make sure that hoses are disconnected. This is especially important in the winter months when exterior water faucets are problem spots for freezing and burst pipes. a) Back up your existing sump pump with a secondary pump. Given the major hurricanes, superstorms, floods, and heavy rain events that our area has experienced over the past several years, backup pumps are becoming increasingly essential in South Central PA.
b) Ensure that your sump pump(s) are operating properly and that battery backups are on standby and ready-to-go. c) Perform a quick rundown of the routine checks listed above – make sure drainage paths are cleared out, supply lines are secure, and your home is in general good working order before the storm arrives! a) Arrange for a trusted friend or family member to perform regular checks on your home (both interior and exterior) while you’re away – especially if you’re going away for an extended period of time. Ask this person to generally inspect all levels of the home, including the basement, as well as the exterior perimeter to ensure that all looks normal. If water damage does occur (burst pipe, leaking roof, backed-up gutter, etc), it’s better for your friend to catch it early rather than allow it to remain untreated for days until you return. b) If you’ll be on vacation for an extended period of time, consider shutting the water supply off at your home’s main water valve. Then drain the water lines throughout the home by running the water until it’s exhausted. Water damage at your home can be costly – but it’s preventable! 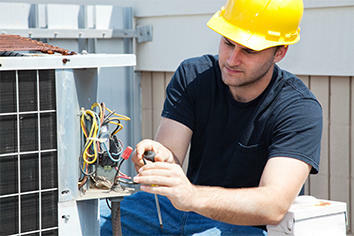 There are easy, DIY checks and repairs that you can perform yourself, as listed above. Should you need professional assistance with any of the items listed here, you can always rely on Tuckey Restoration. We stand ready to serve 24/7/365! If you do experience water damage at your home, Tuckey Restoration is the local expert to call. Keep our number handy – you never know when you might need us! Just call (717) 524-1198 or visit www.tuckey.com for more information.